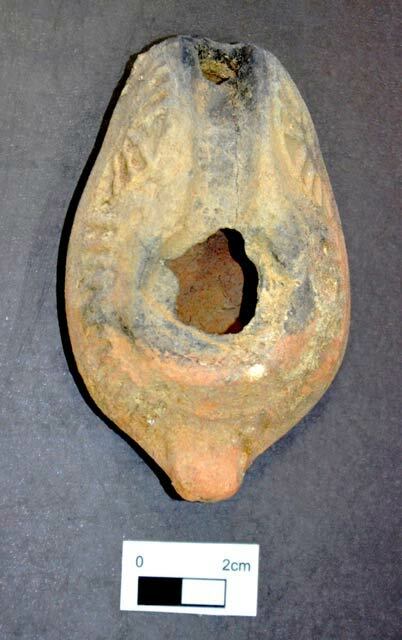 In January 2018, an oil lamp was found near some rocks on the Herzliyya beach at the site of Sidna ‘Ali (Fig. 1). The lamp was discovered by Shlomo and Yoav Nimrodi and handed to D. Barkan of the Israel Antiquities Authority. The lamp was photographed by A. Gorzalczany. 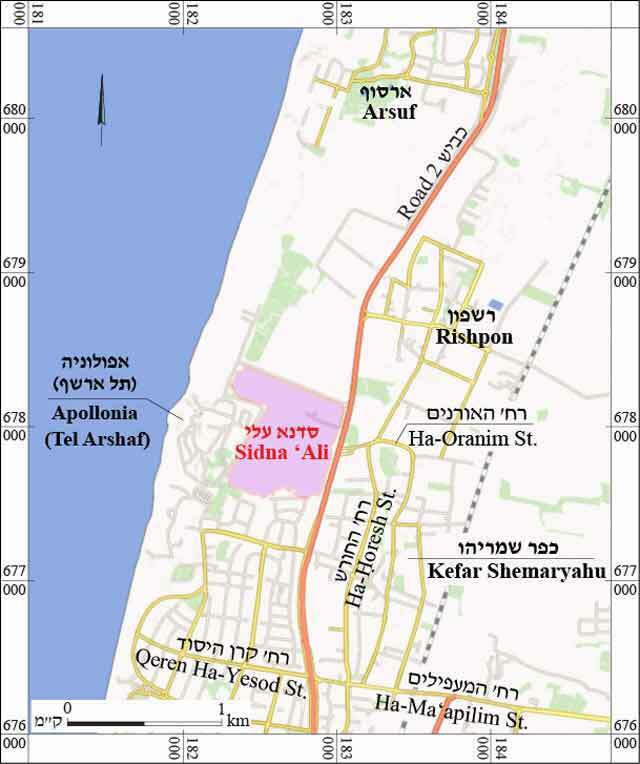 The site of Sidna ‘Ali is located just south of Apollonia-Arsuf (for background, see Haddad et al. 2015). A survey of the site of Sidna ‘Ali yielded pottery from the Byzantine, Mamluk and Ottoman periods. The site is named after a building sacred to Muslims. The structure comprises a large, paved courtyard surrounded by two stories of rooms and corner towers. The entrance is on the north side, near the minaret. In the south part of the courtyard are a sacred tomb and an adjacent dedicatory inscription, which names the structure after ‘Ali Ibn ‘Alem who was killed in 1081 CE. Additional rooms and an octagonal well lie to the north of the courtyard. According to Mujir ed-Din (writing in the sixteenth century CE), the construction of part of the building and the installing of the well took place in 1481 CE. The mosque and most of the structure were built in the Ottoman period, when a jetty for exporting watermelons to Egypt was in use, and the site was reached by a road, Tariq el-Haram. To the west and south of the structure are many Muslim graves (Gophna and Ayalon 1998:24*, Site 16). The oil lamp (Fig. 2) is a ‘Samaritan’-type lamp, which was in use from the Late Roman until the Early Islamic periods. Such lamps have a distinct shape, style and decoration. They have been found in a region historically known to have had a Samaritan population, but other ethnic groups may have used the same lamps (Sussman 2002:339). Identified as Type S2, the lamp has a narrow ‘channel’ along the nozzle, a blocked discus that was broken after firing, a wing-shaped handle and a ring base. Geometric patterns are the predominant form of decoration on lamps of this type (Sussman 2002:342, Fig. 1:5). Such lamps have been found at sites along the northern coast of Israel: Nahariyya, Tel Shiqmona, Ha-Bonim, Caesarea, Hadera and Apollonia (Sussman 2002:340, map). Excavations at Apollonia (East), to the northeast of Sidna ‘Ali, exposed a large refuse pit from the late Byzantine period, which yielded over 200 intact Samaritan lamps (Haddad et al. 2015). The lamp discovered at Sidna ʻAli resembles those found in the refuse pit, and it can thus be assumed that they date from the same period. Gophna R. and Ayalon E. 1998. Map of Herzliyya (69) (Archaeological Survey of Israel). Jerusalem. Haddad E., Tal O., Ajami M. and Harpak T. 2015. Apollonia (East). HA-ESI 127. Sussman V. 2002. Samaritan Oil Lamps. In E. Stern and H. Eshel eds. The Samaritans. Pp. 372–381 (Hebrew).